In a complete 180 from their usual performances, Florida Gators basketball trailed by a substantial margin early and fought back in the second half but were unable to pull off an improbable comeback on the road against the TCU Horned Frogs. Instead, Florida (11-8) dropped another game to a talented opponent as TCU (15-4) picked up a key 55-50 win in the 2019 SEC/Big 12 Challenge. Let’s take a look at what went down for the Gators in their latest loss. It was over when … TCU’s Demond Bane hit two free throws with 3 seconds left to ensure a buzzer-beater attempt by Florida would be all for naught. 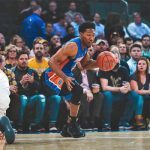 Bane made four free throws over the final 22 seconds to stave off one last Gators comeback attempt, an effort that may not have been necessary had they played any semblance of quality basketball in the first half. 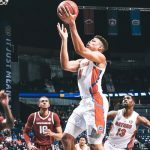 Exceptional efforts: Freshman forward Keyontae Johnson was the best player on the court for UF, scoring nine points on 4-of-9 shooting with eight rebounds in 21 minutes. Though others on the team were able to put the ball in the basket, no one shot or rebounded with any efficiency. This after seeing two players combine for nearly 60 points just one game ago. What it means: Another disappointing loss for a team that looked like it was still on the bus in the first half. 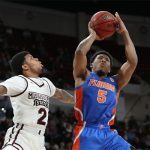 Florida is now 0-7 against the top 40 teams ranked by KenPom.com, which spells disaster for its NCAA Tournament chances. Though some understandably thought the Gators had little opportunity to make the field as is, Florida was actually receiving some love and excuse-making nationally for its tough nonconference slate. Still, UF actually has to beat some quality teams to make the 68-team field, and it has not done so — at all — this season. Up next: The touch schedule continues for Florida on Wednesday when it hosts No. 20 Ole Miss in a game that will air live nationally on SEC Network. It is the first of four games it will play against ranked opponents over the next two weeks.